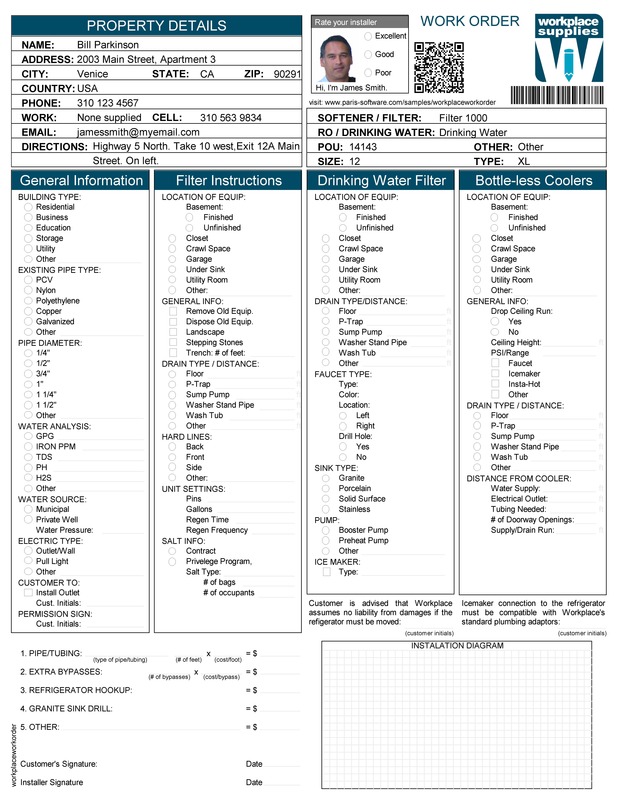 This sample shows how Paris can be used across all industries to print process and field worker documents such as work orders. Many complex business processes are driven by documents to help manage the delivery of services and products, ensure compliance and capture information. Work orders are an example of this type of document. They present information about the work to be done and then provide areas where the field worker can record information such as work done and materials used. This is often a paper-based document often printed on multi-part NCR paper so that a signature can be captured and a copy left with the customer. It is even possible to generate these documents as interactive PDF documents for easy migration to digital processes. In this example, we are are printing two copies of a work order on NCR paper. The customer's signature and other information is captured on both copies through the NCR paper. Alternatively, use interactive PDF objects, such as check boxes, radio buttons, lists and signatures so that the form can be completed electronically for significantly more efficient work order processing.